The Edward Segal, Inc. Model P255 Riveter is the most modern, efficient and flexible long-stroke riveter. A P255 has a maximum rivet capacity of 1/4” diameter and up to 3” long, with actual capacity dependent on rivet type and/or material. This riveter can also be tooled for many heavy-duty metal piercing and solid rivet applications. Maintenance is very simple on the P255; it is pneumatically powered, has only 8 moving parts, and a choice of feed systems depending on the size and shape of the rivets. 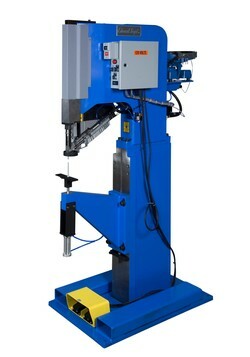 The P255 is built around a heavy steel weldment, and available as a basic head for integration or multi-head configuration, and can also be pedestal mounted, with several anvil brackets to accommodate a versatile range of parts.